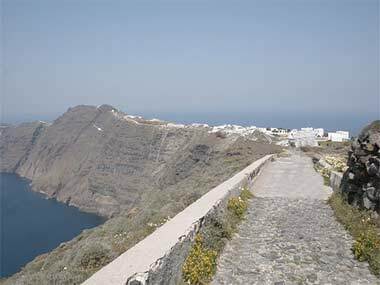 A good place to start your hiking dashes is the long but quite easy path, the favourite of all tourists, that will lead you from Fira to Oia via Firostefani and Imerovigli. It will take you about three hours to reach the end of your destination. 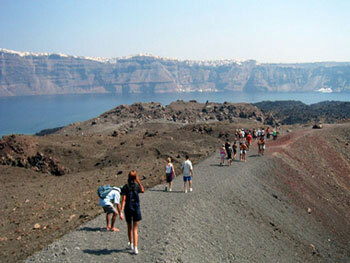 The view offered while hiking is excellent and the caldera looks absolutely magical. Do it during the sunset or early in the morning when the sun isn't yet so hot. The time that it will take you to go to Fira from Firostefani is about twenty minutes or more depending on how many times you stop to admire the view. Many people are seated along the ledge hypnotically staring at the view. You will start your walk from Patsouli, a blunt point near the cable car station in Fira and follow Nomikou street that leads to Nomikos center. Here, the street is descending, it is very steep and tiring and later on the pavement continues to angle upwards and you reach the second highest point, since the cliffs are rising over 300 meters above the sea level but be patient, the path levels as soon as you reach the church Panagia Agion Theodoron. Then the walk dips inland towards the heart of Firostefani, the church of Agios Gerasimos, the catholic church with the cypresses. 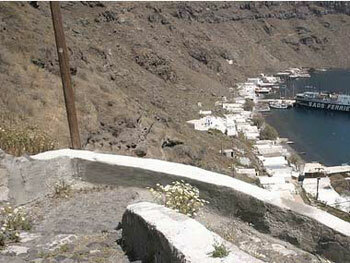 From Firostefani you continue your walk towards Imerovigli, one kilometre away. In the middle of that route you will see the convent of Agios Nikolaos with its five nuns. 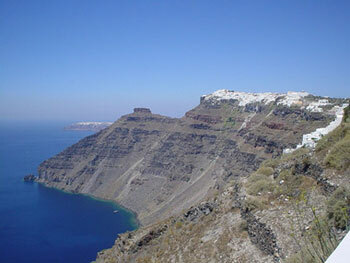 As you approach Imerovigli you will have the opportunity to take a look at its landmark Skaros, the big rock. When you catch your breath move on towards Oia. At some point the road is ascending and it is very tiring especially if it is hot but reaching Oia will compensate you be sure of that let alone the enchanting views. Don't forget to wear your hiking shoes and hats and take a bottle of water with you. If you want a smaller route for your first hiking dash take the stepped trail leading from the Kastro of Oia to the small picturesque port called Amoudi. I have done it myself so you can understand that it may not be that difficult to do it yourselves. So, if you decide to follow my steps go to Oia late in the afternoon and stay in Kastro till sunset. You will know that you are in the right place when you see dozens of people impatiently hanging like pigeons on house fences and mounted on roof tops with their cameras set up and ready. After the sunset and the usual clapping from admiration follow the evident descending stepped trail to the right. The steps are about 250 but don't let that scare you unless you are ascending! I'm just kidding! These steps are wide and quite easy to follow. You'll see other tourists do the same and donkey owners with their donkeys and tourists on their backs going up or down. 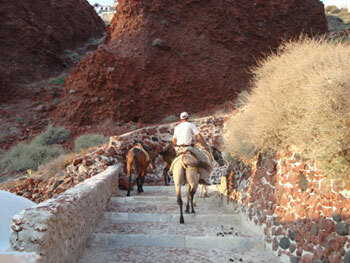 It would be a good idea to go down the stairs walking and then take the donkey back to Oia just for the fun of it. Let alone the fatigue that you will save yourselves from! In Amoudi there is a beach for swimming if you have your swim suits on and several fish taverns if you are hungry from hiking. Thirasia may be another option with its 250-step trail starting from the island's port and leading up the not-so-sheer cliffs. Be careful since going up so many stairs during the summer hot months may not be the greatest idea. 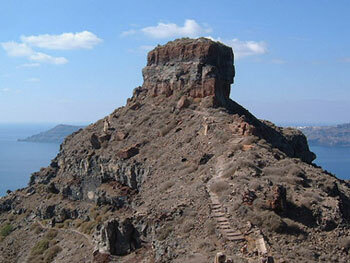 There is also an old trail starting from Profitis Ilias that will lead you to Perissa. 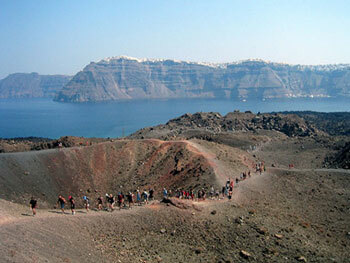 Start from Pyrgos or Emporio in order to make this hike. 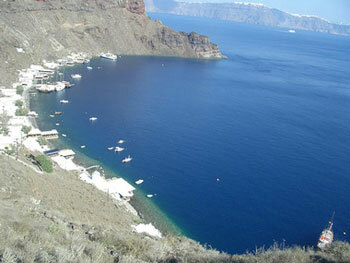 There, you will also find a very good hiking map of Santorini, published by Road Edition, with a scale of 1:40000. The most difficult dash is hiking on Skaros rock. Yes, this is the giant rock situated in Imerovigli. This is very tiring I warn you! You have to go down the path that will lead you to the rock's base where you will start ascending. When you reach the top you will follow the descending path leading to the back of the rock and you will stop when you find the white church that is a bit higher than the middle of the rock. You should probably take the time to rest if you haven't done so already - for about 10 times - and then head back following the same route. Good luck to those who will try it, but don't say I didn't warn you! Most of you will probably go on a volcano boat trip so you will have the opportunity to do some hiking while going up to see the crater. Wear your running shoes and take just a bottle of water with you since everything else will be a burden. The path is a bit difficult, for those who are not used to hiking, that's why many return before the end. It has rocks and dirt and sometimes it gets very steep but it is also very interesting since your guide will provide you with unknown information about the volcano. Choose the best path for you and start hiking! Have a great time!